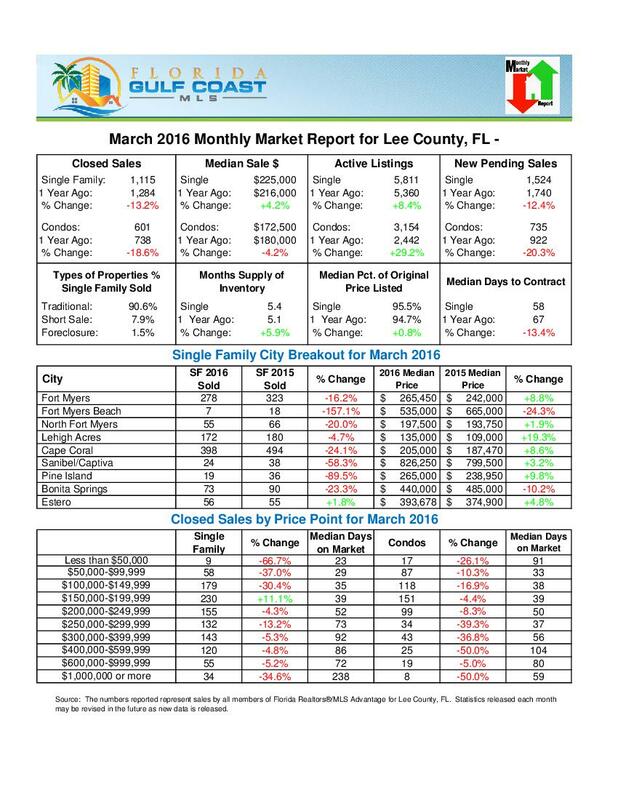 Every month the Florida Gulf Coast MLS provides a monthly market report for Real Estate in Lee County. Below are links to the latest reports. Click on any link to see the month's report. Also, every month, Koffman & Associates produces updated sales charts and statistics. 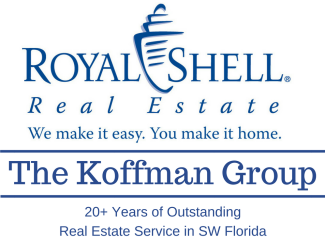 Click here to see the most recent Koffman & Associates Sales Charts. June 2016 saw yet another drop in the number of closed sales in Lee County, but also another up-tick in prices, according to the latest data released today by Florida Realtors®. Last month, there were 1,177 Closed Sales on Single Family Homes, compared to 1,342 in 2015. That is a drop of 12% year-over-year. Townhouse and Condo Closed Sales also dropped, almost 14% year-over-year. Median Price for Single Family Homes in Fort Myers Beach jumped 66% - from $387,750 to $644,000. The number of Active Listings once again shot up in June. Single Family Home listings were up 16% year-over-year, while Townhouses and Condos jumped 39%. Median Sale Price for a Single Family Home in Lee County continues to climb, however. There was nearly a 10% jump from June 2015 to June 2016. The Median Sale Price last month was $230,500. More properties are hitting the market in Lee County, as evidenced by the most recent data released by Florida Realtors®. May saw a jump in Active Listings for both Single Family Homes and Condos. However, the number of Closed Sales did not reflect the new inventory. Active Listings of Single Family Homes in Lee County were up 14% in May 2016, compared to the same time in 2015. Condos and Townhomes saw a much bigger surge of inventory, with a nearly-36% increase year-over-year. The number of Closed Sales on Single Family Homes barely changed from May 2015, with just one fewer Closed Sale in May 2016. There was a 6% drop in the number of Condos that closed in 2016. The same time in 2015, the Median Sale Price was $215,000. Condo prices dropped from a median of $190,000 one year ago to $185,000 last month. While there is in fact an increase in inventory, the Median Time to Contract dropped year-over-year from 64 to 60 days, a change of about 6%. Closed Sales were up in all price points between $150,000 and $399,999. Closed Sales in all of the price points above and below that range dropped.